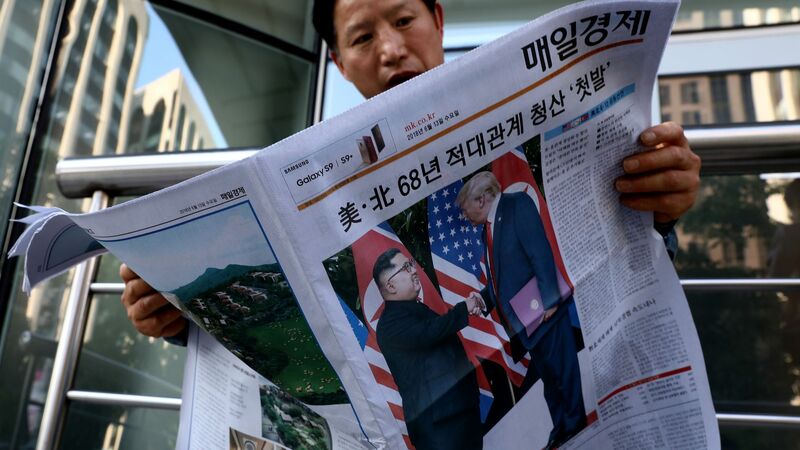 President Trump's summit with North Korean dictator Kim Jong-un, who he called "rocket man" just a year ago, has finally happened, and Trump is hailing it a success. One big quote: "North Korea has great beaches. You see that whenever they're exploding cannons into the ocean... Wouldn't that make a great condo? ... You could have the best hotels in the world right there. Think of it from a real estate perspective. You have South Korea. You have China. And they own the land in the middle. How bad is that? Right? It's great." "I think honestly he's going to do these things." "I may be wrong, I mean I may stand before you in six months and say, ‘Hey I was wrong.’ I don’t know that I’ll ever admit that, but I’ll find some kind of an excuse." Trump asked photographers whether they got a good picture of him and Kim "that makes us look nice and handsome and thin." "I gave up nothing. I'm here. I haven't slept in 25 hours." As reporters shouted questions, Trump turned to Kim Jong Un, saying, "The press, they never stop." On Kim Jong-un: "Well he is very talented. Anybody who takes over a situation like he did at 26 years of age and is able to run it, and run it tough — I don't say 'he was nice' or I don't say anything about it,"
On North Korea: "It's rough. It's rough in a lot of places, by the way, not just there. But it's rough. On his "rocket man" comments and other hostility last year: "Without the rhetoric we wouldn’t have been here....So I think the rhetoric, I hated to do it, sometimes I felt foolish doing it, but we had no choice." The full Fox interview will be aired at 9 p.m. tonight. "I do trust him, yeah... Maybe in a year you’ll be interviewing and I'll say I made a mistake. It's possible. We’re dealing at a high level, a lot of things can change a lot of things are possible." "I've been up 24 hours now straight between phone calls and working it... This is a very, look this is 72 years we’re talking about, and we put it into one very intensive day and some meetings beforehand."